← Hit me with music. Dear god why don’t they make one of these with some sort of rope or string attached? Make them like a croakie right? 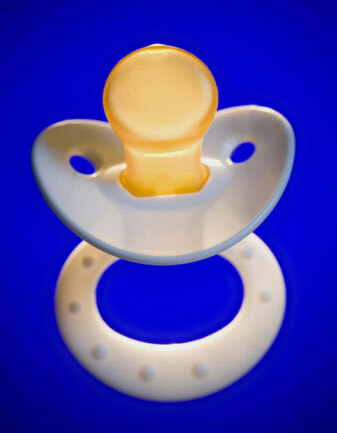 I know only douchey frat guys who attend SEC schools wear these things but if you made them for pacifiers, you’d be rich. If I have to pick one more pacifier up, dust off the dog hair and shoe debris, sanitize it and put it in another mouth only to have it spit back in my face again, I will scream. These babies act like it’s the end of the world when it falls out of their mouth-I mean seriously it’s the end of the effing world. So I oblige and put it back in and then they like sadly and pathetically let it drop from their spit filled mouth only to look at me and cry out of sheer terror that it’s come out again. No joke, in the time it’s taken me to write this post, I have picked up four different pacifiers and put them in two different mouths probably 16 times. And on that note, everyone is screaming at me. Where’s my pacifier? Hmm, when I just said that out loud, the first image that popped into my mind was a giant bottle of wine. 1 Response to I’m going to set fire to my pacifiers. Anna, I know I’m being a creepy stalker, but they do sell those magical things you are referencing. If i can save another mom some sanity I will stalk proudly.